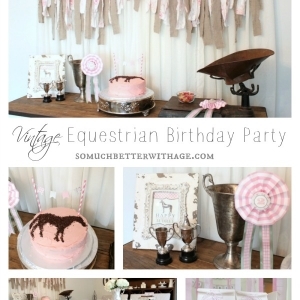 Soon after my daughter’s birthday is my son’s birthday. It’s pretty much a whirlwind after Christmas with back-to-back birthday celebrations. Of course, I love every minute of it. My son is obsessed with being a Superhero probably like any 5-year-old boy. 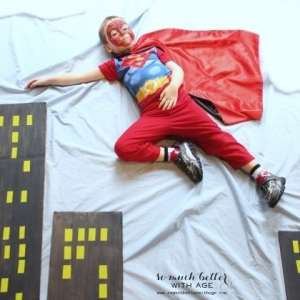 He’s been a Superhero for the past two Halloweens and often wears his costumes around the house just for kicks. 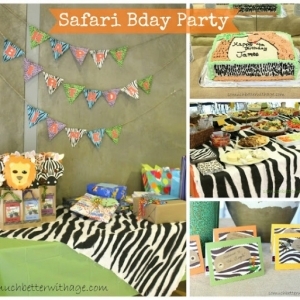 When I asked him this year what he wanted for his birthday theme, at first he said he wanted a dinosaur cake (great!) and then later he said Batman and Spiderman theme. Perfect! Mom can do that. Dinosaur cakes no so much. 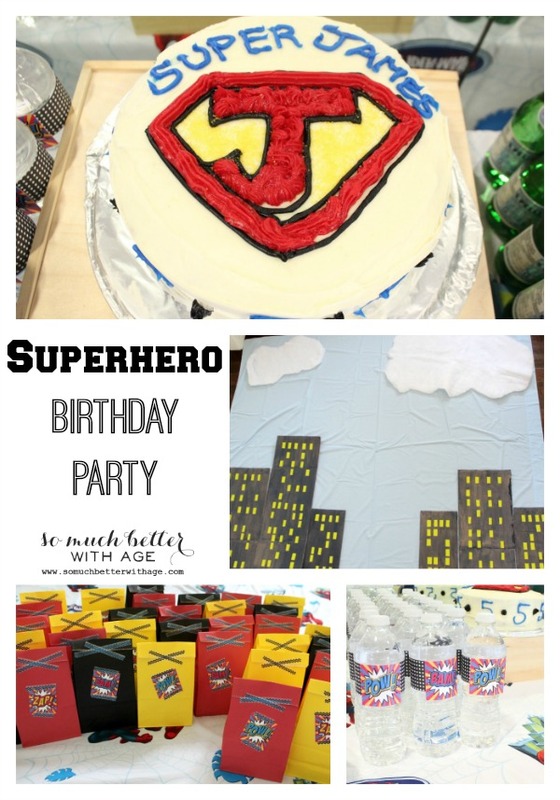 So here are the details and party ideas for you to make a fabulous Superhero Birthday Party! 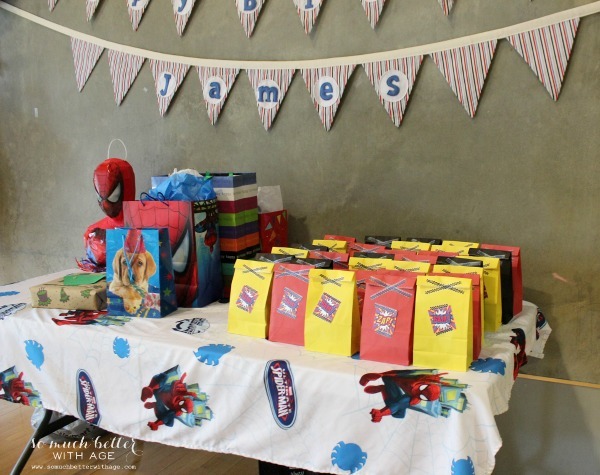 We had his birthday party at then same rec centre for the third year in a row now. 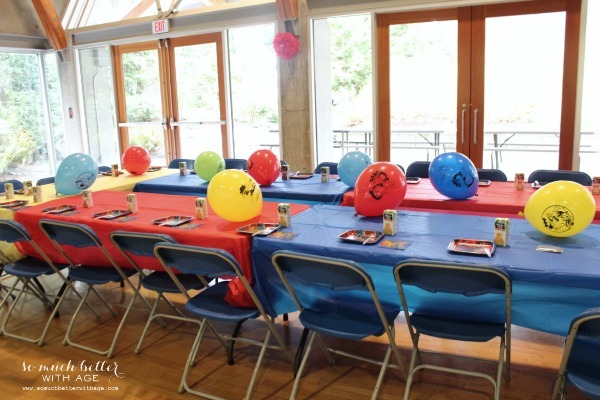 It’s perfect for kids as it includes a bouncy castle, plasma cars, balls, and a huge gymnasium to run around in. 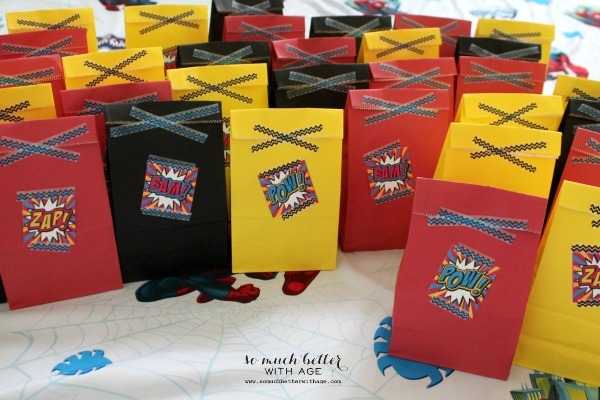 The favors or goodie bags are always fun to make. I grabbed different colored paper bags from Michaels’ and a bunch of colored washi tape. 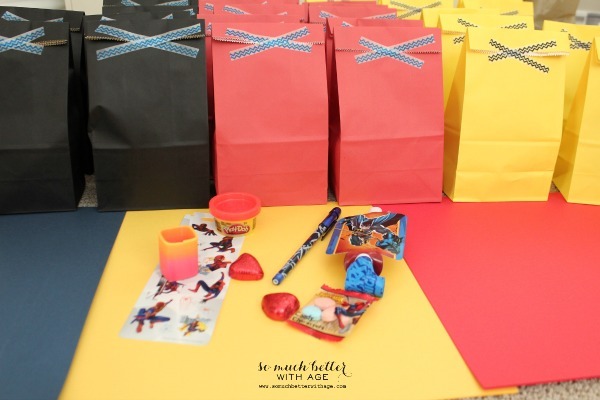 After inserting all the goodies, I taped an X on each bag. Then I found some free downloadable Zap Bam Pow labels online and printed them from my home computer. 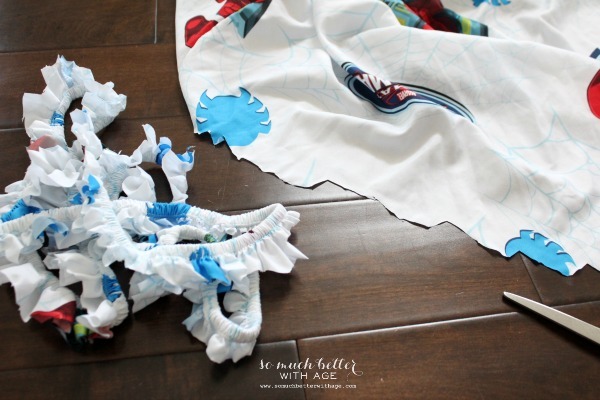 I cut them out and stuck them to the bags with more washi tape. 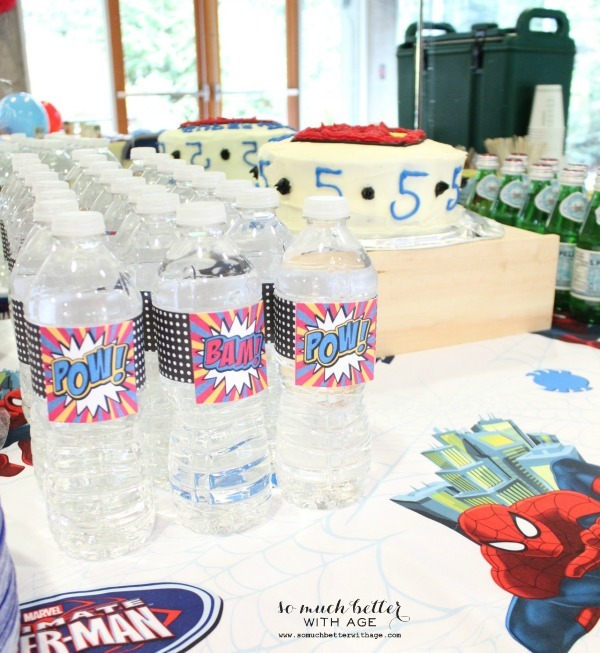 To make Superhero water bottles, I bought a flat of water bottles, took off the label and traced it on some black and white polka dot scrapbook paper. 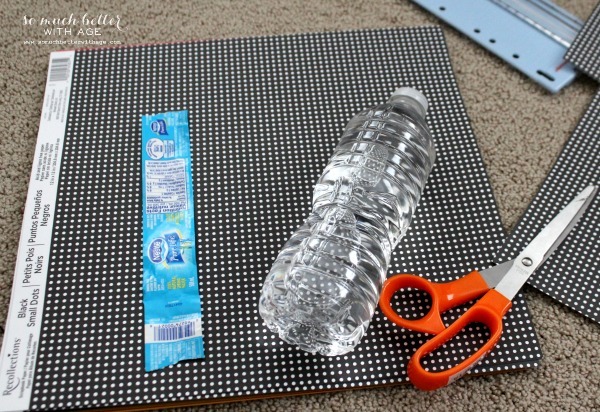 Wrap the label around the water bottle and hold it in place with a bit of double-sided tape. I also added more Zap Bam Pow labels to the front with double-sided tape. 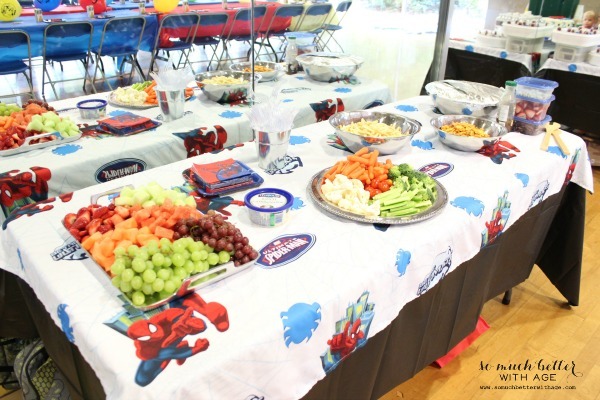 I decorated the kids’ tables with dollar store plastic table covers in bright, fun colors and some Spiderman and Batman plates and napkins. 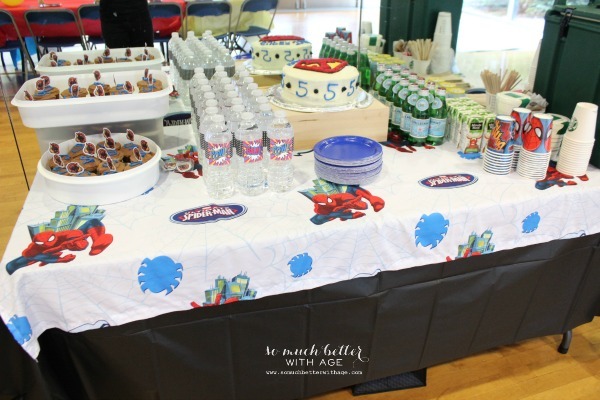 For the food and gift tables, I wanted Superhero tablecloths but of course couldn’t find them anywhere. I decided to make them myself. 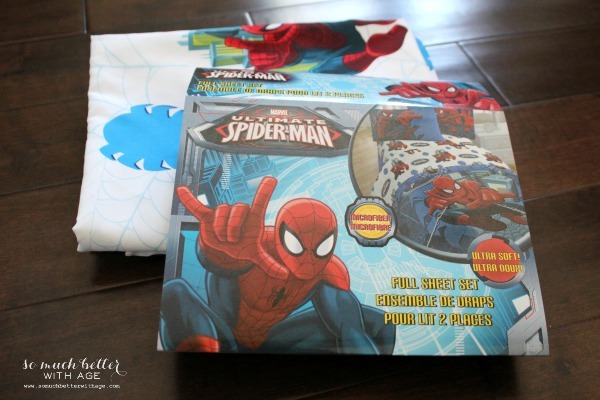 I bought this Spiderman full sheet set at Walmart to use as tablecloths. 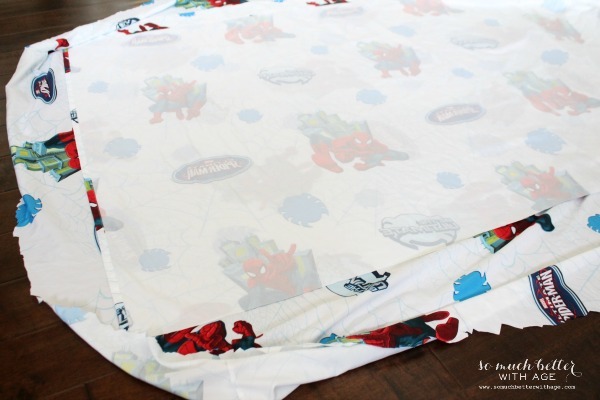 I cut the full sheet in half to make two tablecloths and just hemmed the side that I cut. The other sides were already hemmed. 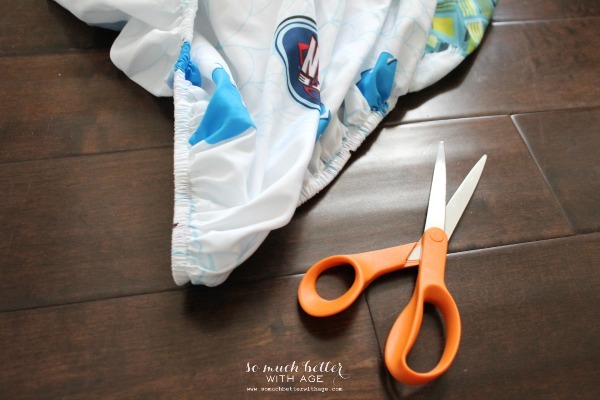 I needed 3 tablecloths so I cut the elastic off the fitted sheet. I measured the size by laying one of the tablecloths over the fitted sheet and cut around it leaving an inch for hemming. I love how they turned out! 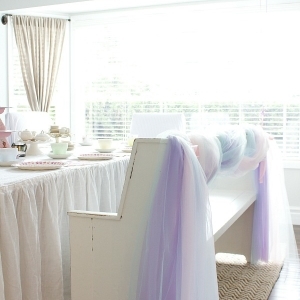 I just added a black plastic cover under each tablecloth. 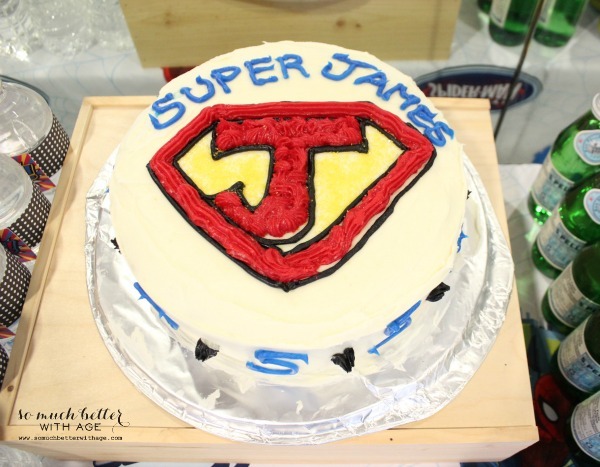 My son absolutely LOVED his Superhero cake. He jumped up and down when he saw the completed masterpiece. I felt it was a masterpiece anyway. This week I’m going to show you how I made the cake and how you can ice a cake like a pro so stayed tuned! 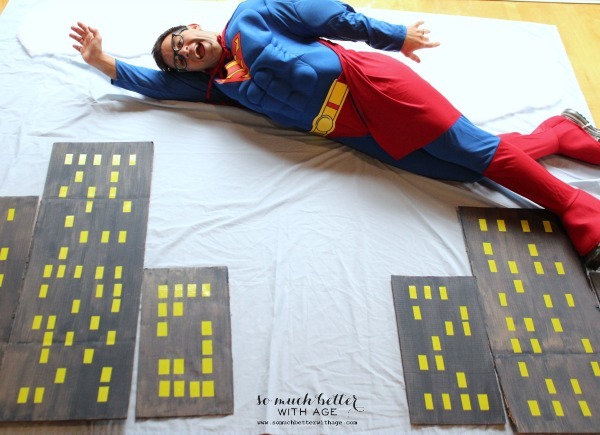 I’m going to show you how I made this Superhero city skyline so kids can fly over tall buildings. And the most important part, the birthday boy was Super happy! 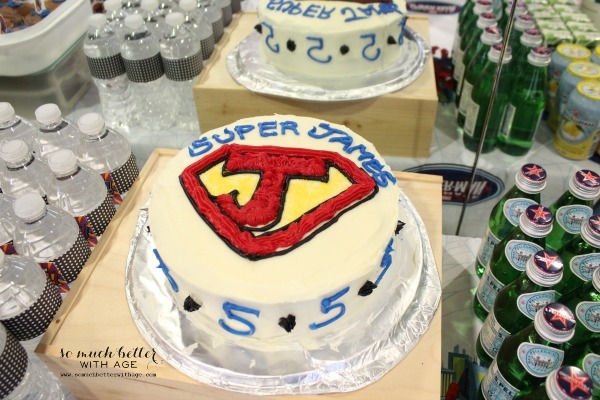 I want a superhero birthday party!!! But not for the kid, I want one for me! Can you come down and help? Mmmkay, thanks!! 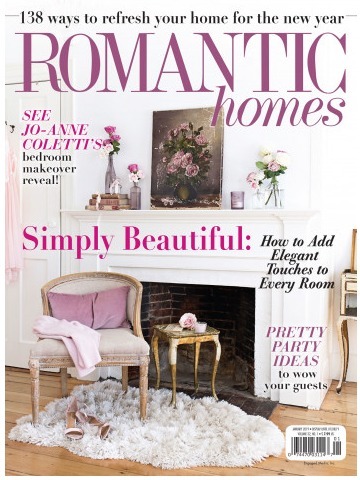 Seriously, though, this is adorable! Thanks girl! 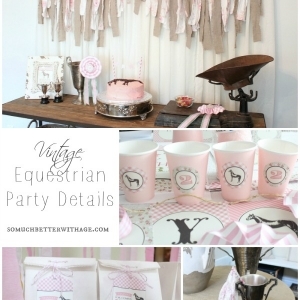 I know you would love this party!! I’ll be there in a second!